In what looked like a scene from a Nollywood movie, a woman got a big NO from her boyfriend after she got down on one knee to propose to the guy in public. The video has since gone viral and is drawing criticism from social media users. 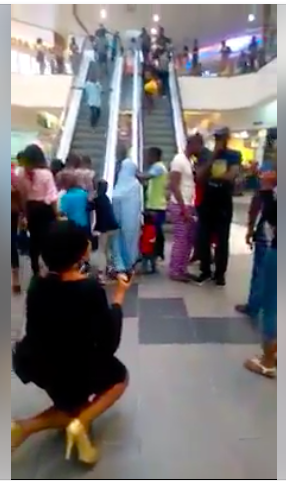 We are not sure where the incident occurred, but it looks like it was filmed in one of The Palms shopping malls in Lagos. In the video, the unnamed woman goes on one knee, holds out a ring then appears to pop the question to her boo who was in company of his friend. The guy, obviously shocked by the act, stands as far away as possibly. His friend walks away leaving him to deal with his mess. He attempts to bolt too but changes his mind. He reluctantly moved closer to the girl who was at this point, was heard begging him to say yes. He grabbed the girl hugged her then takes the ring and walks away. The girl breaks down in tears and is seen crying about. This is not the first time a woman would be proposing to her man publicly. Last week, video and photos of a Nigerian woman proposing to her older white lover went viral. Luckily, the older man felt the same way about his lover so he accepted her proposal happily.